Shake well in spray bottle! Combine first 3 ingredients in a jar with a lid and mix well. Then add essential oil. Store in your preferred soap dispenser or leave it in jar. To make foam baby wash see above “foam soap” recipe. Simply rinse out an empty foam soap dispenser and add 1 inch of your choice of soap. Fill remainder of the bottle up with water. Gently turn side to side (no shaking) to blend. Foam soap at a fraction of the price! 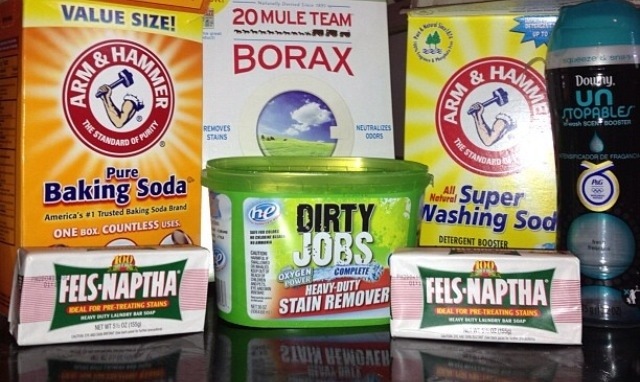 Combine all ingredients and store in a Rubbermaid container or old wipes container. Can be used with cloth wipes or you can cup a thick brand of paper towels in half and place in a container and pour solution over it. For on the go, just put some in a zip lock bag or put solution in a spray bottle. This is the only detergent I will ever use anymore. I’ve used it for nearly two years now and it works just as well if not better than the top name brands. Only you only use one to two tablespoons verses the huge scoop full of fillers. One batch of this cost under $20 and last our large family of seven for about eight months. It’s pretty versatile too, you can use any brand soap you prefer. The scented downy tabs are optional, I just love the fresh scent. I use one tablespoon for an small or average load and two tablespoons for a heavy or really dirty load. It works fantastic with our HE machine too. Just mix all the ingredients in an air tight container and it’s really that simple. I cut up the fels-naptha into cubes and toss them in a food processor instead of using a cheese grater. I also like to add 1/2 cup of distilled white vinegar to each load for a natural fabric softener. All ingredients can be found on the laundry detergent isle or even on amazon. Today I tossed all the toxic chemicals I have been cleaning with for years and made my own! I am done cleaning with poisons that I pay so much for and having to worry about my children or pet getting in them! These are the recipes I made this morning. For the essential oils, I bought them at whole foods and used these different scents: lemon, orange, lime, and mint (I love the combinations of lemon/mint, orange/mint, and lemon/lime) Oh my gosh I love the way our home smells! **store in a one gal jug. **combine all ingredients in a plastic spray bottle. Shake well before each use. Use like windex on glass or mirrors. **place both in a squirt bottle, shampoo bottle works well, and shake to create a gel. Add essential oils and shake again. Squirt the solution all over your tub, allow to sit for a few minutes. Okay to leave sitting over night. Wipe off with a sponge or rag and rinse. **measure & mix borax, washing soda, & white vinegar in a large glass bowl. Heat the water & add slowly while stirring. Once the mixture has cooled, add your essential oils. Add the mixture to a clean plastic spray bottle. **dissolve baking soda in water & place in spray bottle with essential oils. Spray on surface to be cleaned and wipe with a damp cloth. **mix together well in an air tight container. Add one tbsp to each load of dishes. One batch cleans 32 loads of dishes, I made a triple batch for 96 loads! White vinegar! Just pour a 1/2 cup of vinegar in place of jet dry for less than 10 cents instead of the $4 bottle of jet dry! **shake well. Let me tell you how shocked I was at how much money I had been spending on febreeze and the tiny amount of fabric softener it took to make a spray bottle of it! Also have a homemade detergent recipe in another blog post.